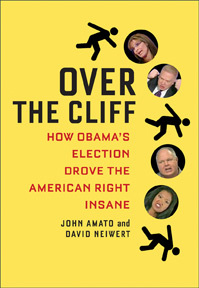 Our new book, Over the Cliff: How Obama’s Election Drove the American Right Insane, is now being sold at Amazon—so please pick up a copy today. You can also buy it from all the major online retailers like Barnes&Noble, IndieBound, Powell’s, and Border’s. Over the Cliff is now available as an ePUB and mobi-Kindlen on PoliPoint.com. This entry was posted in Book sales, End notes and tagged book. Bookmark the permalink.